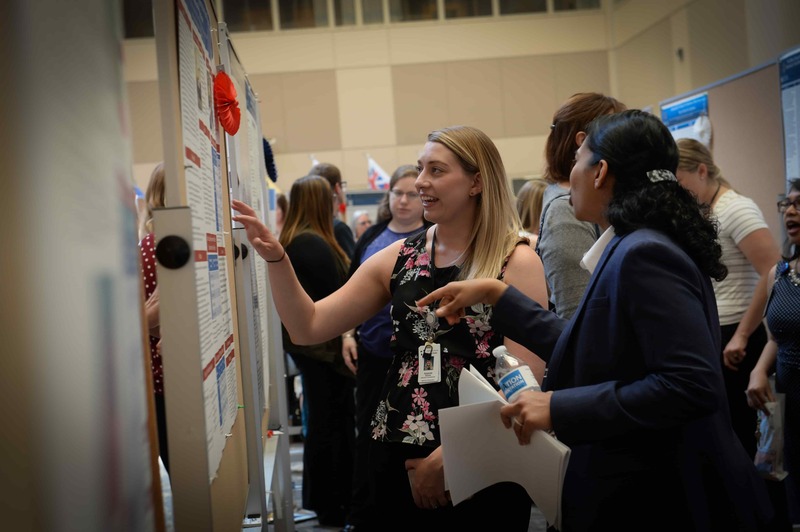 An enthusiastic crowd of over 200 people attended this year’s VA Research Day on May 16 to recognize the accomplishments of Minneapolis VA researchers and to thank the many veterans who participate in research. The day began with award presentations. Dr. Erin Krebs won the first annual Frank Lederle Paper of the Year award for her article in JAMA: Effect of opioids vs. non-opioid medications on pain-related function in patients with chronic pain. Dr. Arianne Baldomero won the Zieve Award for best research by a physician-in-training for her project on the relationship between oral health and COPD exacerbations. The plenary session concluded with a fascinating presentation entitled “Venture science in regenerative medicine: Cloning to clinic” by Jakub Tolar, MD, PhD, Dean of the University of Minnesota Medical School. Participants then proceeded to the flag atrium balcony, where they could snack on freshly popped popcorn while checking out cool new devices under development such as a therapeutic gaming system for use by stroke patients, an arm cycle ergometer, and pressurized pants to facilitate gait training. Attendees also browsed through more than 80 posters describing studies on topics as diverse as the molecular and genetic basis of disease to clinical investigations of interventions to treat PTSD, heart disease, pain, alcohol use disorder, cancer and other conditions. One of these posters, describing Dr. J Irene Harris’ work, caught the attention of a Star Tribune reporter who filed this story a week later on treating moral wounds in soldiers.